India’s present predicament can be fully ascribed to the flawed policies of those who guided India’s destiny since 1947. The person most notable among the lot that set India along a disastrous path is Jawaharlal Nehru. Scores of places, institutions, roads, ports and government schemes are named after him. New Delhi, the city I am currently visiting, is festooned with not just his name, but the names of his relatives. Nehru Place, Kamala Nagar, Jawaharlal Nehru stadium, Jawaharlal Nehru University, Rajiv Chowk, Indira Gandhi International Airport, JN Urban Renewal Mission, . . . the list is virtually endless. And that is just in one Indian city. A comprehensive list of things named after the Nehru-Gandhi family would be tiresomely long. Indians have been fed tons of BS about Nehru and his clan. But truth eventually prevails, as the Indian motto Satyam Eva Jayate (truth alone prevails) says. Nehru was a communist. My friend, Veerchand Bothra, sent me a link to the foreword by Philip Spratt to a book by Sita Ram Goel. Genesis and Growth of Nehruism. 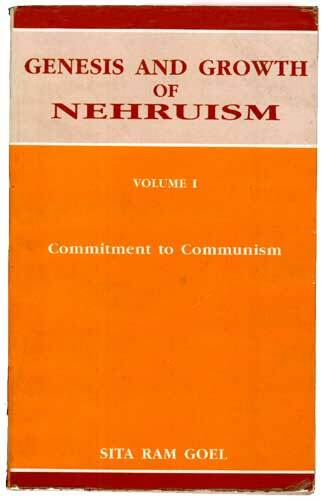 The book and its foreword clearly point to Nehru being a Communist in disguise. It explains the ideological origin of large, dominating, controlling, big-brother government and its overall structure in India. And I think Indira proved to be a worthy successor of Nehru’s totalitarian / communist-state legacy, which she nurtured and grew. You have to keep in mind that this Spratt review is dated October 1963. Nehru was then the prime minister. The bitter fruits of his misguided policies were yet to ripen. The fruit of his loins was not the powerful dictator she was to become. His grandson, Rajiv Gandhi, was 19. Antonia Maino, an Italian whom Rajiv later married, was 17 at that time. Currently she is the puppet-master of the appointed prime minister of India, Dr Manmohan Singh. Who is this Antonia Maino aka Sonia Gandhi? According to reports, her father, Stefano Maino, was a volunteer to the Nazi army and was taken as a prisoner of war by the Russians. I did a google search on “stefano maino fascist”. Read this page. 1. During Nehru’s time Indira Gandhi might have been on the payroll of KGB. Later as per U.S. Congressional hearing records Indira Gandhi’s family most likely Rajiv and Sonia, were on the payroll of the Pakistani Banker the late Agha Hassan Abedi, who founded the Bank known as Bank of Credit and Commerce International (BCCI). BCCI was a drug money laundering outfit finally owned by the ruler of Abu Dhabi, Sheikh Zyed. Mr. Manmohan Singh when he was the governor of Reserve Bank of India was advised by RAW not to issue license for opening the ISI bank BCCI in Bombay as BCCI was funding spying in India and was also funding the Pakistani nuclear programme. Yet Manmohan simply approved it. BCCI was used even by Reliance for its hawala transactions. (BCCI had grown as a result of it running a supply centre for ‘Pakistani minor girls’ to Sheikh Zyed and other leading Sheikhs in the Gulf. Naturally Sheikh became the leading share holder of BCCI. These details are available in the US senate reports.) The BCCI also known as the cocaine bank collapsed with a loss of $ 16 billion. All that Manmohan got was a scholarship for his daughter, but his main benefit turned out to be that the congress party immediately inducted him to the party. Many details are available in our parliamentary proceedings when the collapse of the BCCI was discussed. Sonia had connections to the Vatican Bank which was active in Europe and America drug market where as BCCI specialized in the Asian drug market. Abedi’s reach extended to the U.S. also. He even had the former Secretary of Defense Clark Clifford as his lobbyist for a fee of nearly $100 million. All this was exposed in U.S. Congressional hearings. 2. KGB might have murdered Indian Prime Minister Lal Bahadur Sastri, in Tashkent, by poisoning so that Nehru family can come back to power. Following the India-Pakistan War of 1965, Shastri met in Tashkent with President Ayub Khan of Pakistan and signed a “no-war” declaration. He died the next day Jan 11, 1966. The story put out by KGB that a Muslim cook with Lal Bahadur Sastri’s entourage had poisoned him in Tashkent and escaped to Pakistan may be a cover-up for what KGB had done. 3. Sonia Gandhi was groomed and presented in front of Rajiv Gandhi by KGB, to hook Rajiv which was successful. Subsequently Rajiv marries Sonia. 4. KGB may be involved in the plane accident of Sanjiv Gandhi and might be pure murder to eliminate Sanjiv and to bring in Rajiv as the successor to Indira Gandhi. This paved the way for Rajiv Gandhi to become PM, who is married to KGB agent Sonia. 5. Rajiv Gandhi was killed by the Sri Lankan terrorist group LTTE which is totally supported and financed by christian organizations abroad. Rajiv Gandhi was blown up in Tamil Nadu on May 21, 1991 by a Roman Catholic female suicide bomber Dhanu, 24, whose real name was Kalaivathi. Once Rajiv was killed the external spy agencies might have worked behind the scenes to promote Sonia Gandhi. Potential threats to Sonia’s leadership were one by one eliminated in excellently planned natural accidents which are a KGB specialty. All the deaths of potential future contenders of congress presidency were killed in accidents on Sundays. Sunday murders are a specialty of Christians and this is well proven in India’s North Eastern states where the Christian terrorists murder Hindus mostly on Sundays. Muslims generally carryout terrorist killing of Hindus on Fridays. Rajesh Pilot died in a road accident on Sunday, Jitendra Prasada died of brain hemorrhage on Sunday and Madhava Scindia was killed in a place crash on Sunday. Kamal Nath, another prominent young Congress leader narrowly escaped when a small plane he was traveling in crashed, killing some others on board. On Sunday 30th September. 2001 Madhavrao Scindia who was deputy leader of the Congress in the Lok Sabha and one of its senior-most members, and who was also one of the boyfriend of Sonia in London, was killed along with seven others. They were charred beyond recognition in a plane crash. Seventeen minutes before the plane was due to land in Kanpur, the Air Traffic Control in the city lost contact with it. The plane caught fire in mid-air and became a ball of fire by the time it hit the ground. Mystery shrouds the circumstances under which the aircraft crashed near Motta village in Mainpuri district. The Beechcraft C-90 aircraft used by Mr. Scindia belonged to Jindal Strips and was maintained by India International Aviation Ltd. In June 2000 the senior Congress leader Rajesh Pilot met with the fatal accident in the highway on a stretch between Jaipur and Dausa. Go read it all. Now at last we may be slowly getting an understanding of what evil schemes have brought India to this state. Now we are starting to get glimpses of who is behind India’s descent into a state ruled by the morally corrupt and intellectually bankrupt. The pieces are falling into place and soon enough we will know the names of those who have looted India for their personal gain. All is not lost but we have to wake up. People like Goel saw this coming 50 years ago. Go read the entire foreword by Spratt to Goel’s book. Here’s the concluding bit from Spratt. Nehru’s Communism is revealed in the extraordinary favour he shows to the Communist Party, as contrasted with his marked coolness towards the socialists who put democracy first, like the PSP. He allows the Russian Government, and apparently the Chinese too, to subsidise them. It has been admitted in Parliament that the Home Department knows about some of these foreign funds. No other ruler in the world tolerates this kind of thing. Why does Nehru? His Communism has been clearly revealed in his foreign policy. He cannot go wholly over to the Communist bloc, but he will not take the protection of the free countries, so India remains defenceless. China’s big attack came a year after Goel’s articles, and fully bore out his warning. It even moved Nehru for the moment, but he quickly went back to the policy which made the attack possible. His Communism is also shown in his economic policy. Its deficiencies in Russia and China have become generally known in recent years, but he still persists with it. He is not even disabused of collective farming, despite its spectacular failure everywhere. This over-centralised, one-sided, state-controlled economy is building up a great vested interest, political and bureaucratic and indeed capitalistic, which he doubtless relies upon to keep it going when he has stepped down. Ten years ago the Congress Party was by no means socialistic. When the resolution on the socialistic pattern was passed at Avadi, an important Congressman compared it to the Emperor Akbar’s Din Ilahi. Socialism, he said, is Nehru’s personal fad, which will quickly be forgotten when he passes from the scene. It seemed a shrewd judgement at the time, but it overlooked the attraction of socialism for a ruling party of hungry careerists. The experience of socialism in the nine years since than has won many Congressmen over. But there are still many who oppose it, and its continuance in the future is not yet assured. That, I take it, is the real inwardness of the Kamaraj Plan. The purpose of the current goings-on is to arrange the succession to Nehru in such a way that the pro-communists retain control. The dispute over this question is of the greatest importance for India’s future. But the partisans on both sides are still afraid of speaking plainly, and many of the public are still unaware of what it is all about. Goel’s book helps greatly in making clear what the groups in the Congress are fighting over. It is really whether India shall continue to be ruled by a Government of usurpers, who will go on pushing the country against its will towards Communism, or the Government shall follow a policy which genuinely commends itself to the majority of the public. How can a land so full of promise and potential become so pathetically poor? How did it come to be ruled by the most venal, self-serving, myopic, criminal leaders? There has to be a reason and most likely the answer lies in the personal histories of those who have become its leaders. Groan!! It seems that any right wing crack pot conspiracy theorist gets his moment in the sun on this blog! Atanu I am not sure but have you published the Honorable “professor” P.N Oak as well? Well… Sita Ram Goel’s main claim to fame was his weekly column in RSS mouthpiece “Organiser” – hardly known for its balanced views. And 26/11 was a KGB plot too? You have written frequently about my two fav. authors. Dr. Shour and Dr. Elst. Great to see you finally quoting another one of my fav. Sita Ram Goel. Looking forward to see you quoting Ram Swarup as well. He was not. He had sympathy for red USSR and red PRC, but he was too much of an anglophile to declare himself a communist. But, IMHO, an anglophile communist sympatizer is worse than a proper red communist. He became a handy and effective tool of the communists like KM Panikkar, Krishna Menon and at the later phase of his career, PN Haskar. Had he been a communist, it would have been easier for India to drop his policies after nineties but tragically while communists lost power, the srikhandis (most of Nehru clan) that Indian communists used did not. Do read the final chapter of SR Goel’s autobiographical work – How I became a Hindu (chapter 9: Nightmare of Nehruism). It contains some recollection of Nehru’s early career. It seems that any right wing crack pot conspiracy theorist gets his moment in the sun on this blog! Considering that any left wing crackpot could publish any crackpot theories in the Indian mainstream media (great examples like Amaresh Misra or Aziz Barney) and get media attention, few supposedly “right wing” crackpots in some corners of internet can only make an effort to provide a “balanced” view. But then those who allowed the lefty crackpots to run this country to ground in last fifty years may not be in correct state of mind to take any theory objectively. Do read what SR Goel wrote, not where he wrote. He was the harshest and most objective critique of RSS and it’s political strategy. He became a handy and effective tool of the communists like KM Panikkar, Krishna Manon and at the later phase of his career. Do you know if Volume II was ever published? Shri Goel mentions a future volume in this book, but I can’t seem to find it anywhere.